An Israeli newlywed couple on their honeymoon collided while zip-lining in Honduras, leaving the husband dead and the wife seriously injured, Honduran authorities said. [post_ads]The wife was zip-lining amid the treetops in Roatán, the largest of Honduras’s Bay Islands, when she became stuck shortly before 1:30 p.m. Thursday, Wilmer Guerrero, commander of the Roatán fire department, told The Washington Post. As she remained halfway down the cable, her husband came gliding down the zip line from behind, slamming into her, Guerrero said. While the Israeli Foreign Ministry declined to name the couple, the Honduran news outlets identified the husband as 24-year-old Egael Tishman and the wife as 27-year-old Shif Fanken. The newlyweds suffered a number of serious injuries, including fractured ribs, Guerrero said. Both were still conscious when they arrived at the hospital. By Friday morning, Guerrero was informed that Tishman had died hours earlier. Guerrero said he had not yet learned the cause of death, but Honduras’s Radio América reported that it may have resulted from a brain hemorrhage. On Friday, the Israeli embassy in Guatemala was arranging to fly the husband’s body back to Israel for burial, the Israeli Foreign Ministry told the Times of Israel. The Israeli couple were visiting Roatán as part of a cruise through the Caribbean which they boarded in the United States, according to Honduran newspaper La Prensa. They had just arrived in Roatán on Thursday and were married the previous Saturday, Radio America reported. The Honduran Institute of Tourism told Radio America it regretted the accident, saying it was due to “poor operation” on behalf of the couple. The institute’s director, Emilio Silvestri, told Radio America that the company in charge of the zip line took all appropriate security measures. The Post could not independently confirm that the tourists were guests on the cruise line. Royal Caribbean did not immediately respond to a request for information. 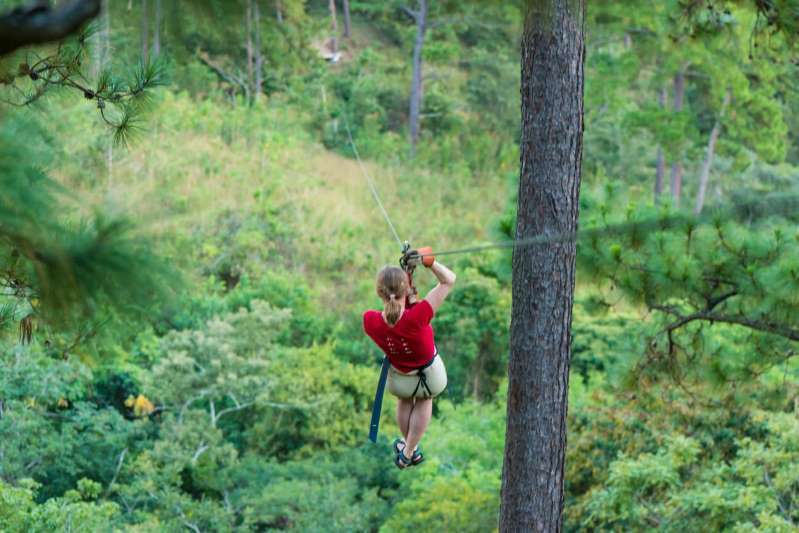 “Swoop above exotic plants, giant African Palms and beautiful landscapes,” reads the Royal Caribbean description of the zip line tour, which consists of 12 zip lines, double gliding parallel cables, 18 platforms and four hiking trails. The longest cable stretches for 1,950 feet and the highest reaches of 300 feet above the ground. The excursion description also states that guests “must consider their physical fitness level and medical history when determining whether this tour is appropriate. It clarifies that pregnant women, guests with back, neck, heart or respiratory problems should not participate in the tour. Roatán, which is about 40 miles long and five miles wide, is located between the Utila and Guanaja Islands off the coast of Honduras. Its beaches and jungle wildlife make it a popular tourist attraction for diving, zip-lining and hiking. It is also home to the largest barrier reef in the northern hemisphere. According to Walker, the maritime lawyer, this is not the first time a zip line excursion in Roatán resulted in injuries. About three years ago, a woman traveling on a Royal Caribbean cruise ship visiting the island was seriously injured while zip lining. And about 10 years ago, a woman zip-lining in Roatán as part of a Norwegian Spirit cruise died when a cable snapped, sending her falling 65 feet, Walker wrote. Zip-lining has boomed in popularity in recent years, according to a study by the Center for Injury Research and Policy at the Research Institute at Nationwide Children’s Hospital. In the U.S., the number of commercial zip lines soared from 10 in 2001 to 200 in 2012, not including thousands of amateur zip lines. The researchers also found that this increase came with a rise in injuries related to zip-lining: About 16,850 nonfatal injuries related to zip-lining were treated in U.S. emergency departments from 1997 through 2012. The most common types of injuries included broken bones, concussions, bruises and strains or sprains.